Behind the Vispronet® brand there are more than 28 years of Sachsen Fahnen® experience, the specialist for innovative system solutions in the field of printing. Private customers, associations, schools, etc. Flag Alliance® a group of leading international companies in the field of textile printing. Worldwide 500 service staff are available to our customers, 250 of them are in Germany. Vispronet® has the right solution for every task, whether it is a single piece or a large order, table decoration or facade cover. We produce best quality with the most cost-effective printing process for you. In digital printing the flags, fabric banners and Bowflag® as well as posters and advertising signs can be produced quickly and cost-effectively on only one piece. This printing process is ideally suited for implementation of multi-color images and color sequences even in small quantities. For printing of large-scale advertising banners on PVC or mesh special printers with a print width of up to 5 m are available. Ordered today and use it already tomorrow - this is possible for many products printed digitally. 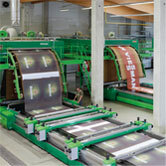 In digital printing Vispronet® can print more than 3 million square meters per year. In screen printing the colors are transferred to the printed material with the use of blade pressing through a fine-meshed fabric. For each colour a separate printing template is required. For larger quantities with fewer colors screen printing is the more cost-effective printing process in comparison to digital printing. 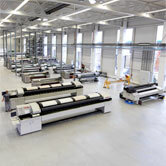 Each year more than 8 million square meters of fabric can be printed using this printing process. 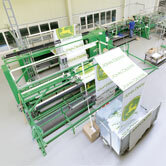 Depending on the order quantity the products can be manufactured either manually or on fully automated assembly lines. 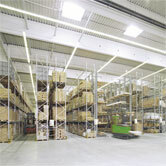 The worldwide delivery of the orders is coordinated and managed in 6000 m2 logistics center with 7,000 pallet spaces. No matter whether it is a neutral dispatch, a dispatch according to distribution plan – all products are delivered punctually, timely, reliably.